Here we see another example of a dicotyledonous stem in which limited secondary growth takes place. Although the cambial zone (CZ) is complete, the interfascicular region (arrows) does not produce significant secondary vascular tissue in this species. 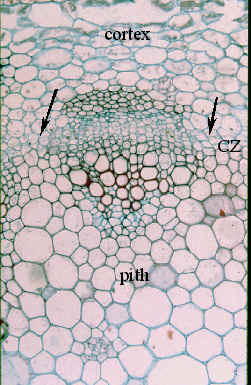 Note the broad band of parenchymatous tissue, immediately exarch (towards the outside of the stem) to the primary phloem.